Beautifully engraved specimen certificate from the IBM World Trade Corporation printed in 1981. 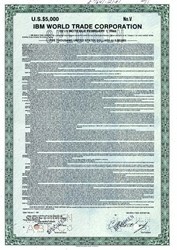 This historic document was printed by the American Banknote Company and has an ornate border around it. This item has the printed signatures of the Company’s Vice President, and is over 31 years old. IBM World Trade Corporation manufactures and markets computer hardware and software products. The company offers electronic data processing machines, calculators, accounting machines, test scoring machines, and typewriters. Additionally, it provides application management solutions. The company was founded in 1949 and is based in Armonk, New York. IBM World Trade Corporation operates as a subsidiary of International Business Machines Corp.